Aerospace engineering graduate student Nathan Shumway has been awarded a National Defense Science and Engineering Graduate (NDSEG) Fellowship. NDSEG Fellowships are awarded through the U.S. Department of Defense to support the increase in number and quality of our nation's scientists and engineers. Shumway is currently working on his Ph.D. under the mentorship of Assistant Professor Stuart Laurenceand is researching untethered dragonfly flight and their response to gusts. Most recently, he and Laurence received an Outstanding Paper Award from the American Institute of Aeronautics and Astronautics (AIAA) Ground Testing Technical Committee (GTTC) for their paper entitled "Methods for Identifying Key Features in Schlieren Images from Hypersonic Boundary-Layer Stability Experiments" at the 53rd AIAA Aerospace Sciences Meeting. Born and raised in the suburbs of Chicago, with a clear view of the approach paths to O’Hare International Airport, Shumway has always been fascinated by things that fly. He received his B.S. in Mechanical Engineering from Rose-Hulman Institute of Technology, where he was involved with the Design Build Fly team, InterVarsity Christian Fellowship and the local chapter of Pi Kappa Alpha. 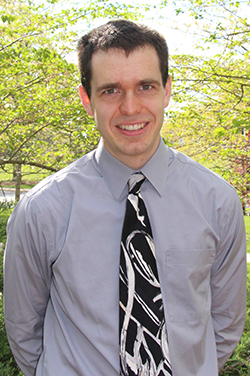 Since he enjoyed his opportunities to do experimental research as an undergraduate student, he chose to pursue a Ph.D. at Maryland. The National Defense Science and Engineering Graduate (NDSEG) Fellowship is a highly competitive, portable fellowship that is awarded to U.S. citizens and nationals who intend to pursue a doctoral degree in one of fifteen supported disciplines. NDSEG Fellowships last for three years and pay for full tuition and all mandatory fees, a monthly stipend, and up to $1,000 a year in medical insurance.